Refreshment is only a vape away with this blend that tastes like the invigorating summer time favorite that makes you feel refreshed and satisfied. Watermelon Patch by SVLT E Liquid seamlessly recreates the light fruit flavor that's sweet, juicy and oh so delectable. This is one of those flavors that has just the right amount of boldness so that you can vape it to your hearts content. 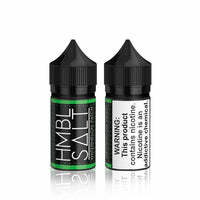 Watermelon Patch - HMBL Salts E Liquid has a rating of 4.8 stars based on 4 reviews.